SPRING HAS SPRUNG AND LEFT WINTER BEHIND. HOW MANY EASTER BUGS CAN YOU FIND? Why should bunnies and chicks have all the fun? 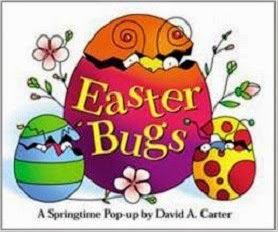 All bedecked in a fresh edition, master paper sculptor David A Carter's popular Easter Bugs : A Springtime Pop-up by David A Carter (Little Simon, 2015) gives his fantastical bugs a chance to pop up and surprise young book lovers. Hiding behind or inside colorful Easter eggs are such imaginative critters as the Shiny Raindrop Bug, The Fleecy-Touchy-Feely Chick-Chick Bug, the Busy Brown Buzzing Bug, and... Wait! WHO IS IN THE JEWELED EGG THAT WILL MAKE YOU SQUIRM? The entire creepy-crawly crew reprise their appearances with a gloriously constructed open-weave pop-out Easter Basket filled with Easter bugs behind every egg-shaped flap, with a challenge to name and count them. Here's one Easter basket filler that is actually good for tots and that will be around long after the pastel jelly beans and sugary peeps are past their prime.